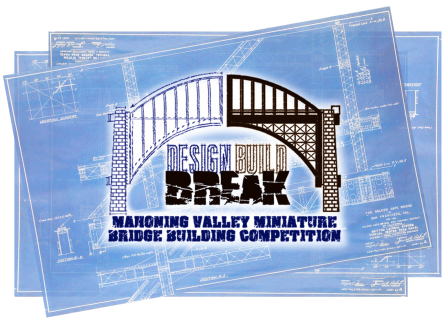 The 12th Annual Mahoning Valley Miniature Bridge Building Competition was be held at ﻿Youngstown State University﻿ on Monday, February 25, 2019. MARK YOUR CALENDARS NOW! 30 teams from 16 area high school competed in the 2019 event. The view a list of results for this year's competition, click the Documents Tab. If you have any questions regarding participation or sponsorship, please contact Anna Gasser at anna@mvmbbc.org or agasser@msconsultants.com. event Synopsis: During the morning of the event, students will construct their bridges on site within the specified time according to competition specifications. After allowing for lunch and glue drying time, the bridges will be judged to meet design criteria and then load tested until the structure fails. The winning bridge will be chosen based on meeting the design criteria and the most efficient load carrying capacity to structure weight ratio. Other awards will also be presented for various aspects of civil engineering.